Developed by Cygames, Project Awakening is a new action-RPG coming to the PlayStation 4. It was revealed as part of Sony’s PlayStation Lineup Tour 2018 event ahead of the Tokyo Game Show 2018, but still remains rather mysterious. You can get an initial glimpse of the gameplay and some hints about its larger story in the announcement trailer. 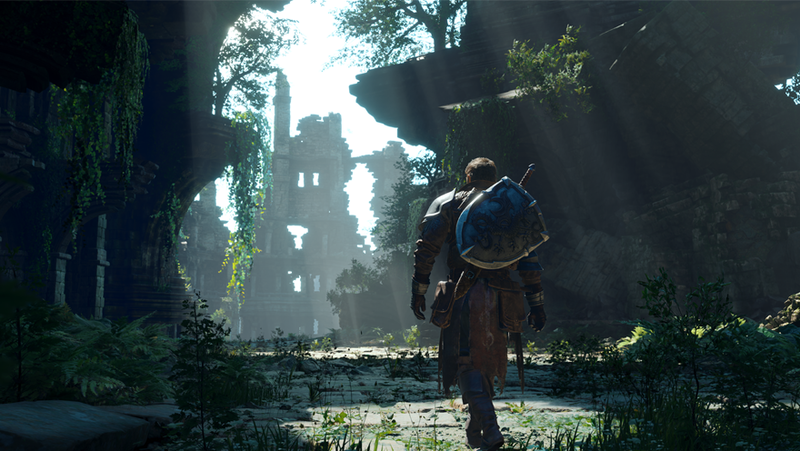 The catalyst for Project Awakening seems to be the end a peaceful era for these “wolves of war.” This trailer focuses on a single male hero who, equipped with his armor and weapons, walks confidently into the world. The setting of the game dominates the first third of the trailer, emphasizing the large landscapes/buildings and, up-close, attention to detail. This hero’s quest culminates in a battle against a large dragon in the video. We watch him block attacks, dodge, and slash the dragon with his sword. We also see the way the environment plays a factor. It creates opportunities to get some distance in battle, but also chances for the dragon to scope him out from higher ground. After getting sufficiently knocked around, our hero finally emerges from the dust. There, he encounters a tree with whimsical properties. In the distance, we see a group of giants, led by a creature with horns and a spear, starting to make their way towards the hero from the fog. Ultimately, we’re left to wonder what role these creatures will play. Few details on Project Awakening are available, but we’ll keep you updated as this story develops. For more from this developer, check out the latest details on the upcoming Zone of the Enders: The 2nd Runner – M∀RS.